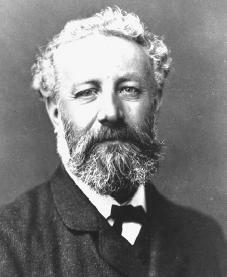 The French novelist Jules Verne was the first authentic writer of modern science fiction. The best of his works, such as Twenty Thousand Leagues Under the Sea and Journey to the Center of the Earth, are characterized by his intelligent foresight into the technical achievements that are within man's grasp. Jules Gabriel Verne was born on February 8, 1828, in Nantes, France, the eldest son of a prosperous lawyer, Pierre Verne, and his wife Sophie. Raised in a middle-class family, Jules despised his parents' constant drive to achieve middle-class respectability. Always rebellious but unsuccessful, Verne learned to escape into his own world of imagination. These feelings would show up in many of Verne's works as an adult. An otherwise uneventful childhood was marked by one major event. In his twelfth year, Jules worked as a cabin boy on an ocean-going ship. The ship was intercepted by his father before it went to sea, and Jules is said to have promised his parents that in the future he "would travel only in imagination"—a prediction fulfilled in a manner his parents could not have imagined. position as secretary of a Paris theater, the Théâtre Lyrique. He continued to write comedies and operettas and began contributing short stories to a popular magazine, Le Musée des familles. During a visit to Amiens, France, in May 1856, Verne met and fell in love with the widowed daughter of an army officer, Madame Morel (née Honorine de Viane), whom he married the following January. The circumstance that his wife's brother was a stockbroker may have influenced Verne in making the unexpected decision to embrace this profession. Membership in the Paris Exchange did not seriously interfere with his literary labors, however, because he adopted a rigorous timetable, rising at five o'clock in order to put in several hours researching and writing before beginning his day's work at the Bourse. Verne's first long work of fiction, Five Weeks in a Balloon, took the form of an account of a journey by air over central Africa, at that time largely unexplored. The book, published in January 1863, was an immediate success. He then decided to retire from stockbroking and to devote himself full time to writing. Verne's next few books were immensely successful at the time and are still counted among the best he wrote. A Journey to the Center of the Earth (1864) describes the adventures of a party of explorers and scientists who descend the crater of an Icelandic volcano and discover an underground world. The Adventures of Captain Hatteras (1866) centers on an expedition to the North Pole (not actually reached by Robert Peary until 1909). In From the Earth to the Moon (1865) and its sequel, Round the Moon (1870), Verne describes how two adventurous Americans—joined, naturally, by a Frenchman—arrange to be fired in a hollow projectile from a gigantic cannon that lifts them out of Earth's gravity field and takes them close to the moon. Verne not only pictured the state of weightlessness his "astronauts" experienced during their flight, but also he had the vision to locate their launching site in Florida, where nearly all of the National Aeronautics and Space Administration's (NASA) space launches take place today. Verne wrote his two masterpieces when he was in his forties. Twenty Thousand Leagues Under the Sea (1870) relates the voyages of the submarine Nautilus, built and commanded by the mysterious Captain Nemo, one of the literary figures in whom Verne incorporated many of his own character traits. Around the World in Eighty Days (1873) is the story of a successful bet made by a typical Englishman, Phineas Fogg, a character said to have been modeled on Verne's father, who had a mania for punctuality, or the art of timeliness. Other popular novels include The Mysterious Island (1875) and Michael Strogoff (1876). Verne's total literary output comprised nearly eighty books, but many of them are of little value or interest today. One noteworthy feature of all his work is its moral idealism, which earned him in 1884 the personal congratulations of Pope Leo XIII (1810–1903). "If I am not always what I ought to be," Verne once wrote, "my characters will be what I should like to be." His interest in scientific progress was balanced by his religious faith, and in some of his later novels (such as The Purchase of the North Pole, 1889), he showed himself to be aware of the social dangers of uncontrolled technological advance. Verne's personality was complex. Though capable of bouts of extreme liveliness and given to joking and playing practical jokes, he was basically a shy man, happiest when alone in his study or when sailing the English Channel in a converted fishing boat. In 1886 Verne was the victim of a shooting accident, which left him disabled. The man that shot him proved to be a nephew who was suffering from mental instability. This incident served to reinforce Verne's natural tendency toward depression. Although he served on the city council of Amiens two years later, he spent his old age in retirement. In 1902 he became partially blind and he died on March 24, 1905 in Amiens. Costello, Peter. Jules Verne: Inventor of Science Fiction. London: Hodder and Stoughton, 1978. Evans, I. O. Jules Verne and His Work. New York: Twayne, 1966. Reprint, Mattituck, NY: Aeonian Press, 1976. Jules-Verne, Jean. Jules Verne: A Biography. New York: Taplinger Publishing Company, 1976. Lottman, Herbert R. Jules Verne: An Exploratory Biography. New York: St. Martin's Press, 1996. Lynch, Lawrence W. Jules Verne. New York: Twayne Publishers, 1992. Teeters, Peggy. Jules Verne: The Man Who Invented Tomorrow. New York: Walker and Company, 1993. How many siblings did he have when he was a child?